There are times when I need to make a super easy party appetizer that tastes really good. My church hosted a bridal shower recently and I made Pecan Sandies Banana Pudding and Bacon Wrapped Cocktail Smokies. Both of these are simple to put together, and always get rave reviews. I learned a long time ago that recipes don’t have to be complicated to be delicious. Whenever I’m running short on time or just want to make something simple and tasty, I turn to this recipe. When I make Bacon Wrapped Cocktail Smokies, I always wrap the wieners in the bacon early in the day. That way I can pop them in the oven 20-25 minutes before serving so they’ll be nice and hot and crispy. I usually buy Lit’l Smokies, but my grocery store happened to be out of them so I grabbed a different brand. Since this shower is pretty big, I doubled the recipe so I bought two packs of thick-cut bacon and two packs of cocktail smokies. There was a whole lot of wrapping going on! 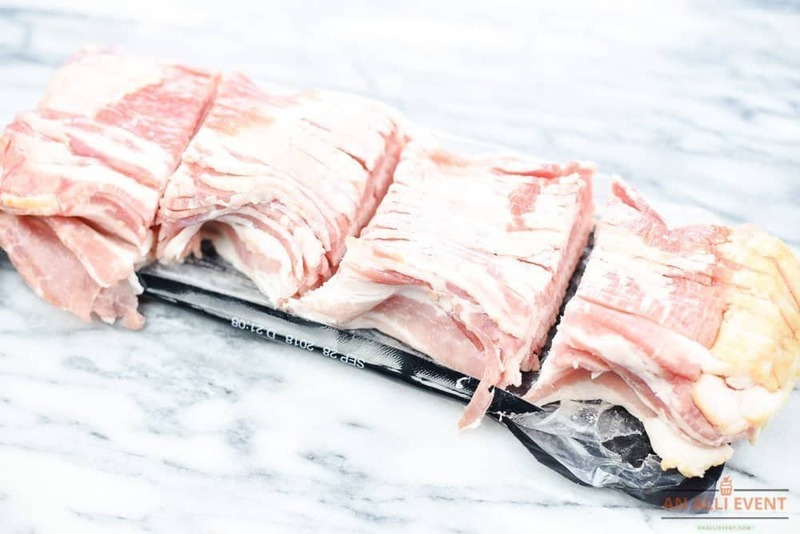 Cut the slab of thick-cut bacon into 4 pieces. Make sure you cut all the way through. Check out how I keep my kitchen knives sharp. 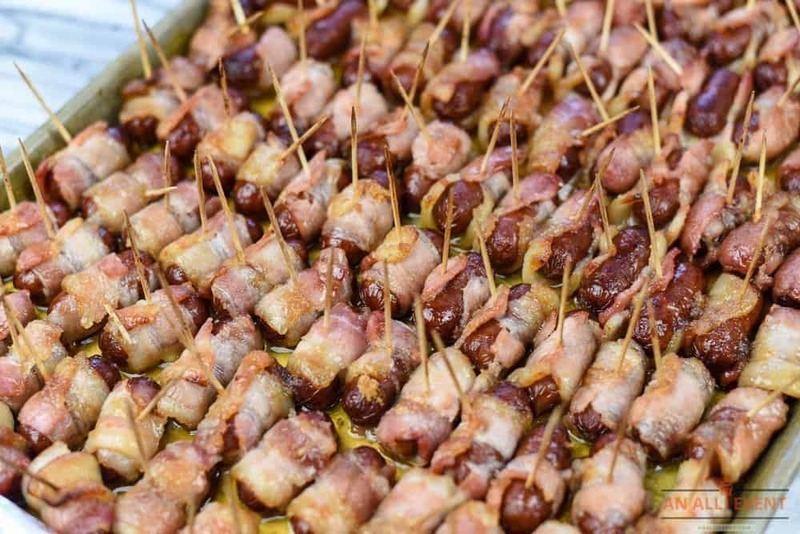 Wrap a piece of bacon around each cocktail wiener. Secure with a toothpick. Place on a foil-lined baking pan. At this point, you can refrigerate the bacon wrapped cocktail smokies (for a few hours) until ready to bake them. Sprinkle one cup brown sugar evenly over the Smokies. Bake at 400º F. for 20-25 minutes or until the bacon is crispy. Cut the slab of bacon into four equal parts. Wrap a piece of bacon around each cocktail smokies. Secure with a toothpick. 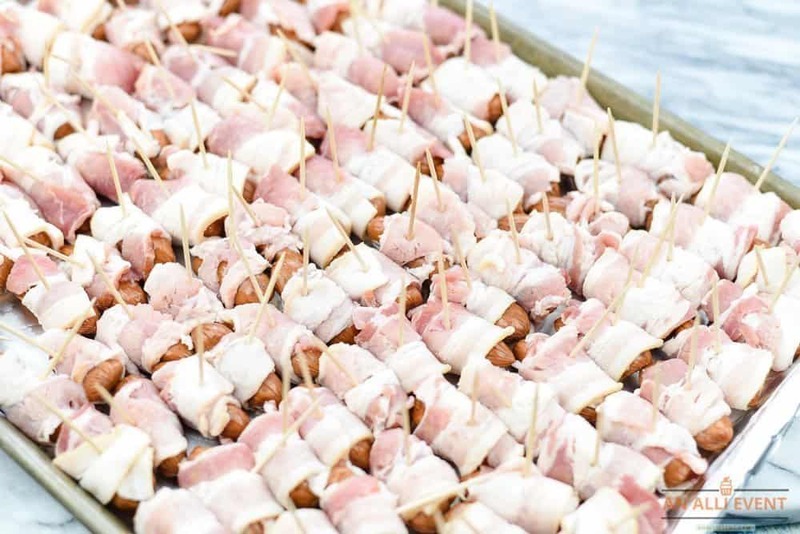 Place bacon wrapped smokies on a foil-lined baking sheet. Bake at 400º F. for 20-25 minutes or until the bacon is done. 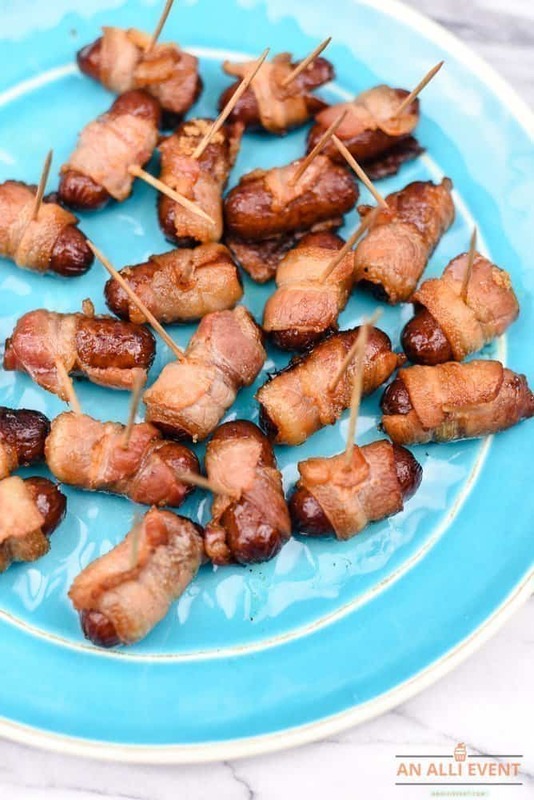 If you are planning an appetizer party, make sure and serve these bacon-wrapped cocktail smokies. They are so easy to put together. Plus, your guests will absolutely love them! With football season coming up, these are perfect to serve to your family and guests. Yum, a sweet and salty appetizer is always good. I like your idea of doing the “work” earlier in the day and then just popping them in the oven right before they are needed. My mouth started watering the second I read the title of this post. Everything in the title is heaven to me. I am totally going to be making these. 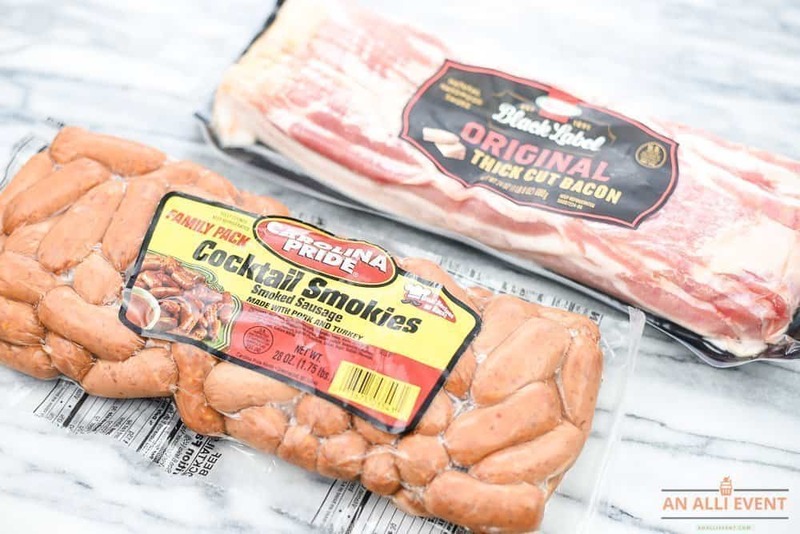 I love Bacon and my son loves Cocktail Wienies and I had planned on making them for dinner this week so I can’t wait to make some with Mac and Cheese for him and then use your recipe to make some for my husband and I and since I love Bacon and my husband is such a good guy I know he will give me his Bacon. So off to the store I go. I could see those disappearing pretty quickly around my house! I need to try making them soon. These smokies do look amazing and would be great for a party. I agree that a recipe does not have to be complicated to be good. Please excuse me while I drool. I’m a fan of all things bacon so I must make these soon! They’d be a perfect movie snack for family movie nights. Any dish that includes bacon is going to be a hit with me. I made some turkey bacon quesadillas yesterday and the bacon flavor really set it off. Those will be a hit in parties. I love making those little smokies for pigs in a blanket. Yum! Everything tastes so much better with bacon. I love the simplicity of this recipe and can’t wait to try it. I love it! I think it’s awesome that you’re sharing this easy recipe. It’s great when friends come over. Everything’s so easy about this dish. I don’t eat meat but my kids and husband would LVOE these! They are all about bacon. I love recipes that are easy and delicious! These are great for any type of party! These remind me of pigs in a blanket but without the carbs!! PERFECT! I am totally going to try this recipe one day because I love the convenience of finger foods like these!! We love these at our house. It is one of our Christmas party staples. The guests gobble these up first. Oh, that, and shrimp cocktail! I am new to cooking and as a housewife I want to learn more recipes so I can provide different menus to my hubby. This one sounds interesting. I hope I can successfully make this too.